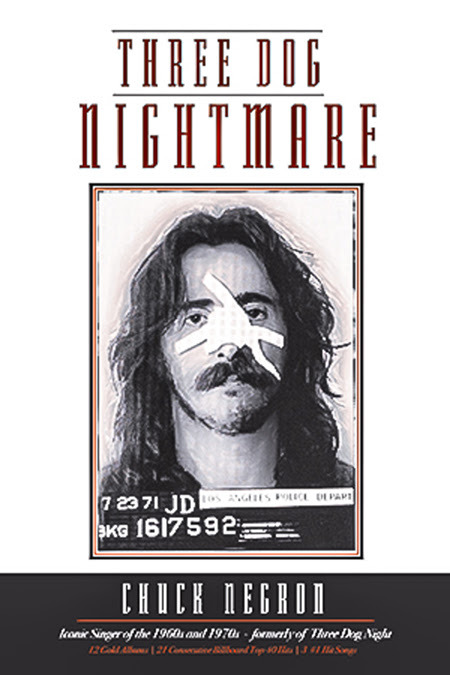 LOS ANGELES, Calif. (January 15, 2018) – The evocative account of how Chuck Negron went from the height of worldwide fame and success, to the depths of delusion, despair and almost death and rose again to stardom and stability is documented in 11 new tell-all chapters and over 100 new photographs in “Three Dog Nightmare: The Chuck Negron Story.” The book will be released on March 13 and is now available for preorder on www.ChuckNegron.com and Amazon. “As a shy adolescent growing up in The Bronx, NY, I never dreamed I would have lived the life I eventually did. From the exhilarating rollercoaster ride of fame and fortune, to the pathetic life of a heroin addict, to redemption, sobriety and a new opportunity to be a respected man,” said Negron. The journey is very sad in places, uplifting in others as Negron tells it like it was. Even if you have not followed the career of Three Dog Night, you will be captivated by the honest narratives about what was happening behind the scenes shared by the voice himself. Chuck Negron, formerly of Three Dog Night, has been captivating audiences for over five decades with his iconic vocals, unique humor and brilliant storytelling. His catalog of hits are timeless and appeal to music fans of all ages. In 1967, Negron became a founding member of Three Dog Night; a vocal trio having roots in R&B, rock-n-roll, and urban doo wop, creating a style of music that was totally new and unique. The world was introduced to Negron and Three Dog Night in 1969 by the band’s first million-seller “One.” Driven by Negron’s solo lead vocals on four million-selling singles, three #1 records, (one which topped the charts for six weeks, “Joy to The World”) five top 5 hits and seven top 40 hits, he put and kept Three Dog Night on the charts for six years. He performs upwards of 70 shows a year giving audiences the opportunity to hear his impressive volume of hits plus an exciting repertoire of new songs from his numerous solo CD’s. Negron released a new album this summer backed by the vocal talents of his two youngest daughters, Charlotte Rose and Annabelle Quinn, aptly named Negron Generations, and will release his final edition of the award-winning book “Three Dog Nightmare” this Spring. For more information please visit www.chucknegron.com.